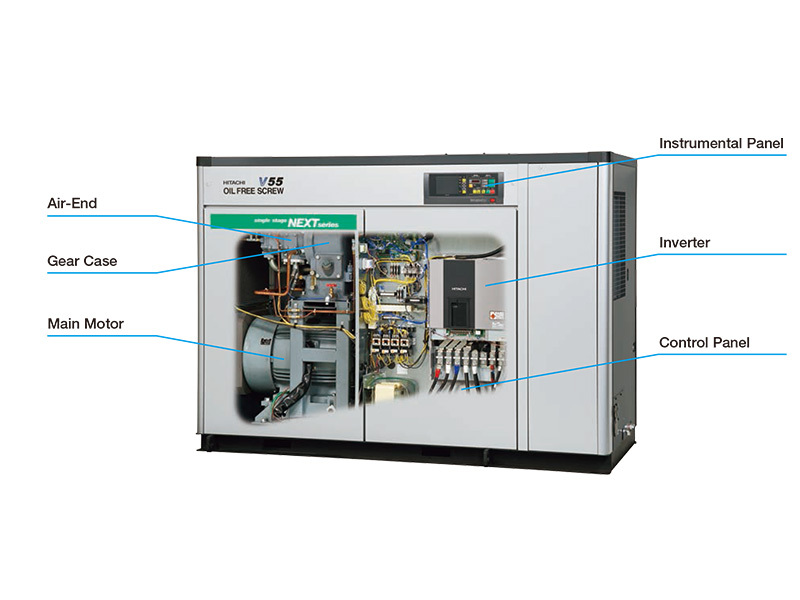 Test and analysis of condensation of oil in the discharge air of Hitachi Oil-free Screw Compressor (DSP) are implemented by third party (TÜV) based on ISO8573-1 standard. By the test result, oil contained in the discharge air of Hitachi DSP is proved and certiﬁed as the highest level of quality air “Class 0”. ISO8573-1:2010 CLASS 0 TÜV Certiﬁcation TÜV (The Technische Überwachungs Verein), a Germany based international test service provision third-party on aspects of technical safety and quality evaluation, is globally well-reputed on its neutrality and expertise as well as its strictness in testing. *The image described above has been modified. By estimating use point pressure in accordance with air consumption, IPC control decreases discharge pressure during low load operation, which enables Energy-Saving. *Due to estimation control, use point pressure varies in accordance with use conditions. *IPC control range of the constant speed unit is air consumption ratio of 50% or more. *Necessary to prepare aUSB flash memory device(5.5cm or smaller) on user’s side. *Necessary to prepare a Bluetooth® USB dongle on your side. *For setting changes, part of the items are applicable. *Modbus® /TCP support is optional. *Bluetooth is the registered tradmark of Bluetooth SIG, Inc (US). *Modbus is the registered trademark of Schneider Automation Inc.
*Bluetooth is the registered tradmark of Bluetooth SIG, Inc (US). *Modbus is the registered trademark of Schneider Automation Inc.